Last Friday, I received an intriguing phone call. A woman had seen the recent piece on my Halifax Public Gardens Memory Project on the CBC evening news and she wanted to donate a framed photograph. Like any intrigued historian, I gratefully said yes. The photo, still in its original frame, is hand labeled “Public Gardens, Halifax, N.S. Christmas Day, 1934” and depicts one of the Gardens’ snow-covered treed “allées”. The picture had been given to her daughter over twenty years ago by the girl’s great aunt, who herself had found the picture at a rummage sale in Campbell River, B.C. The mystery starts here. Did this photo belong to someone from Campbell River who once visited Halifax and took the photo as a memento, or did the picture find its way across the country after belonging to a Haligonian with a fondness for the Halifax Public Gardens? The new visual turn in historical studies would at least encourage us to recognise that the photographer evidently considered the Public Gardens, with its fresh snow, as a space worthy of visiting on Christmas Day and capturing on film. Everything else about the picture was, and remains, a mystery. This photograph is the latest submission I have received for my Heart of Halifax Memory Project which officially launched on June 10th at the Halifax Public Gardens 150th birthday bash. Despite some popular confusion with “Canada 150”, this year also marks the sesquicentennial of the Halifax Public Gardens. Within this “150” context (and with my admitted love for spatial history), I began thinking about how the Public Gardens have been situated in the middle of the city for over 150 years. Instead of being concerned with how the Public Gardens “came to be”, I wanted to explore the changing ways the public utilised and engaged with the Gardens since its founding. The project, funded by the Suellen Murray Educational Bursary, is a study of public engagement. The first part of the study relies on traditional archival material such as city committee minutes and correspondence which shows that beyond the expected promenading by visitors, the early 1900s was a popular time for military bands to hold concerts in the Gardens. The First World War caused an increase in requests from groups such as the IODE who wanted to sell ice cream in the Gardens as a fundraiser. In 1919, St. John Ambulance, Halifax, requested to sell refreshments, cigarettes, and matches at the Gardens. I have also come across a collection of postcards (1900-1938) which are revealing for their images and messages. Garden vistas and photos of the Boer War memorial fountain (reflecting a sense of national and militaristic pride prevalent at the time) were popular depictions (even eBay has some hidden gems). To explore a more current period, the Friends of the Public Gardens have graciously lent me the guest books from the past two years so I can analyse and map from where visitors have come and their comments. Consulting newspaper records and editorials reveals a shift in public engagement throughout the 1960s-2000s. For instance, in 1969, Halifax newspapers were littered with editorials expressing concerns over keeping the Public Gardens in good condition. One went so far as to proclaim that there were “plenty of other parks for hippies and vagrants to sleep in” (Halifax Mail Star, August 26, 1969). These articles reflect tensions between community members wanting to preserve the Gardens as a clean, botanical space, and those who wanted to use the civic space as they saw fit. Similarly, the 1980s saw a battle between condo developers and those who wanted to preserve the area around the Gardens. Yet, perhaps the most significant illustration of public engagement (and affection) was in 2003 when Hurricane Juan caused significant damage to the Gardens (which by this time had fallen on hard times). Over the course of one weekend, a radio campaign raised over one million dollars to restore the Gardens. While these sources are valuable, I felt that for a project on public engagement, I ought to ask the public about how they used and viewed the Gardens. The latter part of this study, therefore, seeks to collect memories and objects pertaining to how people have interacted with the Gardens. I put out a public call for submissions via email and social media and created a pop-up display in Horticultural Hall in the Gardens. 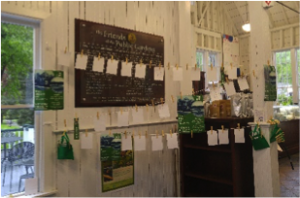 The display was designed to resemble a washing line – something familiar that would subconsciously remind people of days gone by, and would encourage them to physically peg their own stories and memories onto the line. There may be people who are skeptical of this method of collecting personal memories and stories through a pop-up display and email submissions. I have ensured through an online consent form, however, that individuals can request anonymity. While memory collection like oral history has well-defined methodological guidelines, this way of recording and collecting is fluid and is left much more to the individual in how they wish to construct, frame, and share their recollection. There may be those too who are skeptical of the use of “memory” to adequately understand the past. While memory can change over time (see, the field of memory studies), meaning that we cannot solely rely on it for historical inquiry, I argue that memories are valuable as memories. A memory or retrospective reflection of a place or event can illuminate the past, while also illustrating someone’s feeling towards the present. Thus, I am using the Heart of Halifax project as an experiment to see what emerges when we, as historians, weave together archival sources and non-archived sources. Many traditional archives simply haven’t recorded the social and cultural nuances of people’s lives, ignoring another access point to the past. Another aim of this project is to encourage people to share their memories using #HPG150 and monitor how and what the public shares on social media to record their engagement with the Gardens. So, what are the results so far? The first emailed submission was from Amber Collins-Grimmer, a Haligonian who has visited the Gardens since she was a child. When she got married, it meant a lot to her to have her wedding photos in the Gardens, and when the Gardens reopened after Hurricane Juan, she and her husband raced down to see if their big tree had survived. Three years ago, while taking family photos in the Gardens, the couple’s son wanted to recreate their wedding photo. On the evening she wrote to me, the family had just returned from the Gardens and she sent me the resulting photo diary of their visits (photos taken 1999, 2014, 2017). Not only does Amber’s writings reflect her view that the Gardens have played an important role in her life, but the photographs span nearly twenty years and illustrate a modern fascination, which I argue is imbued with nostalgia, of recreating photos of special meaning. Another submission came from Barbara Bickle who recalled living in Halifax during the early 1980s and often attending Sunday afternoon band concerts in the Gardens. Furthermore, in 1983 Barbara and her mother decided to spend Christmas in a hotel in Halifax. Despite living six blocks away, they “chose The Lord Nelson Hotel because of its view of the Public Gardens”. The pop-up display was quickly populated with stories ranging in theme and time span. Some recorded their childhood: “my parents used to bring us to the Sunday afternoon concerts – four kids – dressed in our smocked dresses, ribbons in our hair. We got the North Ferry in Dartmouth & then to the gardens. Great memories!”. Others reflected sadder memories: “I planted a tree in the Gardens 25 years ago to commemorate the loss of a worker – as my husband was. I still visit it regularly”. Still others reflected the Gardens as a space and inspiration for healing. Interestingly, the display also received additions from much younger individuals like one, clearly written by a child, that stated “A egle [sic] ate my popcorn” or another, from a teenager, that read “Prom 2k17 with the best date <3 – Mylene”. These submissions clearly captured current moments that will soon fade into memories. Although unexpected, I find it fascinating that the display encouraged people of all ages, both visitors and Haligonians, to share their stories and how each personalised memory intersects at the Gardens. The project will continue for the next few months, and I look forward to reviewing the submissions I have received. 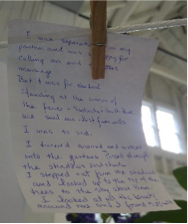 The Heart of Halifax Memory Project, however, has already taught me that collecting memories has two benefits: not only are the submissions revealing new historical documents, photos, and objects, but they are also acting as a snapshot of the present. By recording and sharing these memories, we are, in essence, creating a natural time capsule of the 150th anniversary of the Public Gardens that may be looked back on in another hundred years as a sign of how the event was commemorated (indeed, I am aware of my role as participant-observer). This project is by no means exhaustive but may reveal the benefits of engaging with the public for social and cultural history projects, particularly micro-histories of public spaces – time will tell. 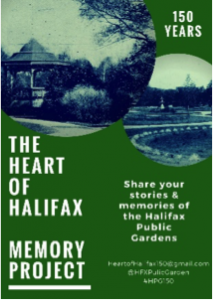 At very least, it is my hope that the Memory Project has brought back individuals’ fond memories of the Halifax Public Gardens. Perhaps this Project may even be able to solve the mystery of who took that photograph of a snowy Gardens on Christmas Day, 1934. Claire L. Halstead, PhD is a Research Associate at the Gorsebrook Research Institute for Atlantic Canadian Studies at Saint Mary’s University. She is currently working on her Halifax Explosion digital project (HExD, funded by the Nova Scotia Museum) in addition to preparing her manuscript on British children evacuated to Canada in the Second World War. I didn’t see a way to contact Claire with photos, etc… Is there a ‘best method’?